The key behind getting a high-yield account is to find a so-called “online bank," because unlike traditional banks, online banks do not have the expense of maintaining branches and therefore can offer annual percentage yields of 1.50 percent or more. This is more than 15 times higher than the national average of 0.08 percent for traditional bank accounts. While 1.50 percent may not sound like much, it can add up. For example, if you have a buffer of $10,000 in your bank account, earning close to zero interest, you would earn $150 over a year. If your average balances are higher, you will earn more. And every little bit helps. And note that these high-yield accounts are still FDIC insured, so you have zero added risk. Are you thinking about creating passive income for a rainy day as a project manager? Have you investigated high yield accounts as an alternative to what you are doing currently? Project management positions can be fickle. 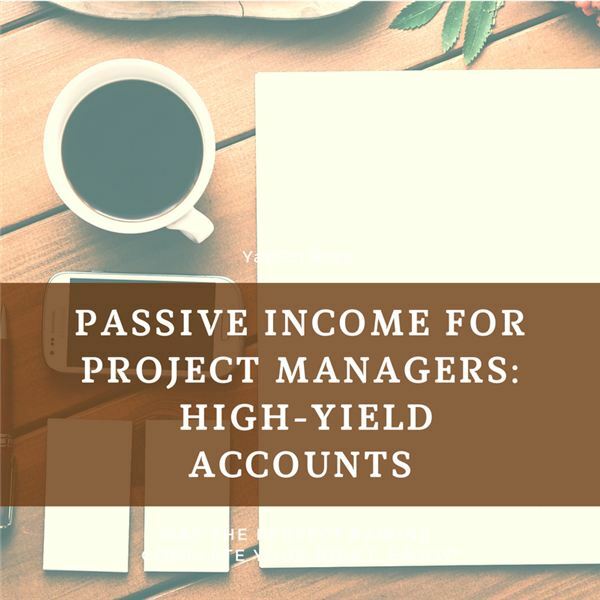 This series explores initial steps, requiring minimal effort, to help you generate a growing level of passive income to build a cash flow buffer between projects.